Add a touch of color to your dessert display using Krylon® glass finishes. Protect lazy Susan with newspaper or other protective barrier. Place cake stand on top of Lazy Susan. Clean all dirt and debris from the glass cake stand to ensure smooth, even paint surface. 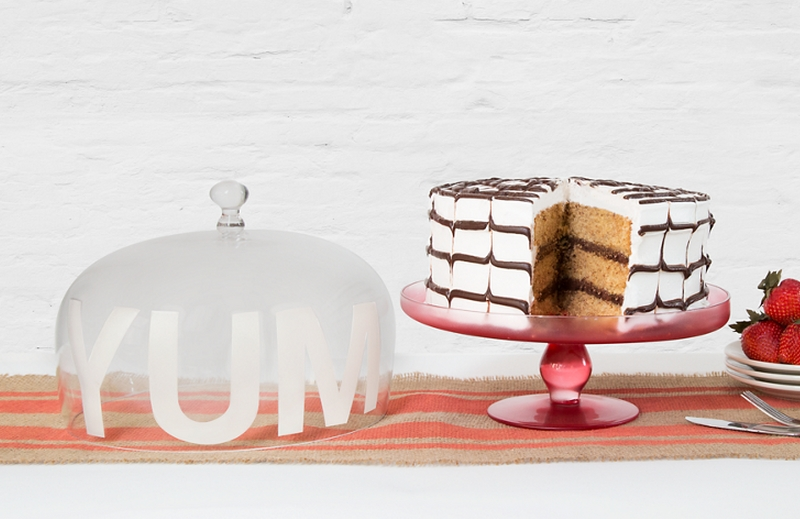 Using Krylon® Easy Tack Repositionable Adhesive, spray letters and place on the lid of the cake stand. Using Krylon® Frosted Glass Finish, spray the lid of the cake stand with heavier coats toward the top and lighter coats toward the bottom to create a gradient effect. Set aside to dry. Using Krylon® Stained Glass Paint, spray the cake stand with Cranberry Red in even coats until desired intensity has been achieved. Allow time to dry. Carefully remove stencils from the lid of the cake stand.